Langton Public School is the successful recipient of $16,700. 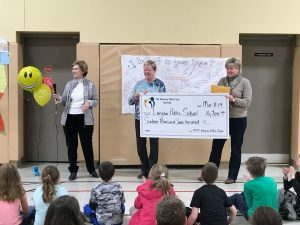 On February 13, 2019 100 Women Who Care Norfolk selected Langton Public School as the recipient of $16,700 (presented by member Diane Luke). The money will be used to purchase playground equipment. Equipment which was originally installed in 1993 was deemed unsafe in 2017 and removed. The goal is to raise $50,000 and to date the school has successfully raised $35,000 through various fundraising initiatives. They are committed to purchase multiple pieces of equipment which would be suitable for children aged 5 to 12. This equipment must be accessible for children with special needs. The Langton school has a self-contained autism class who, along with the entire Langton community, will benefit from this purchase. This brings the total donations since May 2014 to just under $313,900…supporting 20 local charities. 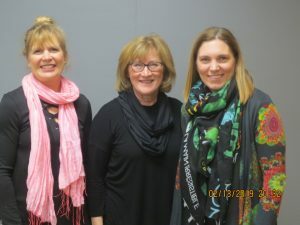 Pictured l to r are the members who presented on behalf of 3 different charities: Jennifer Walker presented on behalf of Norfolk General Hospital Foundation – Rehab Department; Diane Luke presented for Langton Public School; Rebecca Malo presented on behalf on Strong Start. To learn more details about this charity as well all previous successful charities, to go the “Charities” tab on this web site. Are you someone who is interested in helping others but is stretched for time? Do you want to be a part of an empowered group of women who want to make a direct, positive and immediate effect on the lives of others – right here in Norfolk County? Would you like to network with other like-minded women in Norfolk County? Corner of Culver & Water, Simcoe – enter off Culver Street. Please check the Web site to confirm the location. What is this Organization? What is expected of me? Army, Navy & Airforce Bldg., 53 Water Street, Simcoe Corner of Culver & Water, Simcoe – enter off Culver Street. Wednesday August 14, 2019 and Wednesday November 13, 2019. Please check the Web site to confirm the location.